48 backers pledged $5,960 to help bring this project to life. 6K - Unlock wooden engraved boxes to transport your dice, tiles, tokens and tower in! A free additional 1" custom token of any wood and finish with every pledge! Ebony, gold leafed edges, anything goes! We play Dungeons & Dragons weekly. Our figurines are a mess. Believe it or not, there is a pixie, a gorilla playing a half-dwarf, and a blue dragon represented by a small turtle. I started with slicing dowels into wooden nickels and pressing the fibers with various instruments to write and draw in them. This did not solve my problem. Not only did I discover that this process is wonderful at cramping your wrist but that it was too slow and not what I had envisioned. Our map is handy, but requires artistic as well as storytelling abilities to immerse the players. As you can see, the map could be much better. Did I mention that this is not portable and restricts us to one playing location? My goal is to create beautiful, functional, affordable, quality hardwood tokens, map tiles, and other gaming accessories using a laser engraver. What are they? What do they look like? Why is this worthwhile? Well, take a look. One of my biggest things is using high quality hardwoods. Not only will these tokens have a wonderful feel, high durability, natural beauty and mesmerizing click-clack because of the woods they are made of, but each piece is unique and impossible to recreate. Although back-to-back slices of the wood may have similar grain and color, each part of a matched set will be as unique as the next. For some fresh pictures of the wood I have lined up, check out update #2! As you saw above, small home games often stretch their imaginations and confuse themselves borrowing tokens from piles of coins or other games. A computer generated rendition of how engraved tokens will look when cleaned of ash. Ironwood Engraving will provide access to affordable character and NPC tokens. Ranging from one to three inches by default, a player would be able to pick up his or her preferred token image engraved on hardwood with the character's name and have it shipped for under five bucks. Storytellers can have the pleasure of picking up sets of creatures to match their story. Giant rats? Orcs? Maybe an electric eel? The storyteller can order a set of NPCs and have them ready for the next session. Keeping track of ongoing effects is important and for some games flat out necessary. Naturally, these are planned to be printed as well. Available in the same sizes as the tokens (1", 2" & 3"), they will also be available in an overhang size that will allow the words to stick out from underneath the normal sized token. I've tried a lot of things for play surfaces. Dry erase erases easily... often too easily. Wet erase can be messy and requires water at the table to risk spilling. Both of these require the story teller be particularly fond of and good at drawing and even then it isn't long before the players start asking each other which squiggled brown wall had the window in it. I've tried other tile sets, too. The cardboard sets were easily knocked into disorder and succumbed easily to drink condensation. Another wooden set was blank and I couldn't add details I had hoped for. So why are these different? The tiles are solid hardwood. It takes a good bit of water to upset them without a coat of sealer, and all of the products will come sealed as the default and included finish. This also means they come with a satisfying click-clack. The tiles interlock. Bumping a map and fixing it aren't a big deal, but when it goes back together and you're no longer within range for your best attack, heads will roll. Locking the tiles together means you can peacefully coexist with the guy who always bumps the map. Tiles lock into tiles from any Ironwood tile set and connect any edge to any edge allowing you to rotate the pieces but still connect. The tiles are textured. A laser engraver provides amazing possibility to put the feel of the world right on the world's tiles. Pebbles, wood floors, hewn stone and grass are all within our grasp. The laser won't simply color the surface like a printer but engrave into the surface allowing for a three-dimensional finished relief. On the left is a blank "Full Sheet" of tiles showing the zig-zag, locking piece edges as well as the straight lines that divide larger tiles into squares. On the right is the same sheet with a sample stone texture. The laser will engrave more wood from the darker areas and less from the light to create a tactile, 3D surface rather than a flat, printed face. For example, this would allow stones to sit atop a dirt floor or a skeleton atop wooden planks. The tiles have features. Bookshelves in libraries, wells in towns, and mounds of gold will be found on these tiles. Looking to set up a wizard's research room? You can pick up a desk, perhaps the glass beaker rack and even a magic portal set into the stone floor. The tiles are portable. I play on a cumbersome 30"x60" acrylic board that hates staircases. These tiles pack into a shoebox and enjoy the close quarters. Want to play in a new location? Pack 'em up. Picnic tables, school floors or a table in a diner at 4am, these tiles will love to go for a trip. For more pictures, check out this update! Tiles are awesome. Tokens are wonderful. But sometimes you want that little extra to help the party really feel in the space. Circles on the table as trees don't immediately answer "Can I climb it?". The scale of giant mushrooms is not always appreciated until you can walk under them. A cardstock mockup of a large tree accessory resisting high winds. The finished product will be out of 1/4" hardwood and still engraved on both sides of the wood, though with textures, not marker. So here is where the dungeon accessories come in. Built as you would a dinosaur skeleton from balsa, these trees, mushrooms, and other three-dimensional features are fully textured on both sides of the wood allowing you to see leaves on the branches and gills under the mushroom. Need dead trees for a creepy scene? Impressive altars? I'll have them. While I was thinking of rewards for this kickstarter, I started to ask friends, "What could I do that would be awesome with the engraver AND related to gaming?". I looked at some of the intricate cuts and lacy designs people had done with other projects, and I couldn't pass up using this ability. The current dice tower layout showing innards. I am offering intricately engraved dice towers standing at about twelve inches with a base just over four inches square. Currently, these only discharge side to a single side, but should do so with wonderful sound as the die rests hidden from the back after the roll. The laser engraver will allow me to make wonderfully beautiful pieces of art that still have that handcrafted quality. In a world of mass produced plastic that may not have seen a human before you open the box, I'm rather excited to make gaming tools that will allow other players to experience the same joy that role-playing has given me. So, here's a window into how I plan to produce what I offer. The art you see on these tokens and tiles is hand-picked for the pieces they represent. If you have a custom image you want and have the rights to have it reproduced, I will gladly work with you to get that image on the wood. The supplier I am going to has an amazing wood collection. You may be familiar with 2-by-4's and plywood, but this is a candy shop for woodworking. I can offer domestic woods such as red oak, cherry, walnut and maple, but also exotics such as wenge, leopardwood, tulipwood and ebony. I examine each piece by hand before purchasing. Could I have it show up at my door on a pallet? Sure. But I wince with concern about the quality just as you do. Each piece is touched, measured, and possibly over-analyzed for color, dimension, and defects. Warped boards happen. Checks, too. But I don't want to risk sending you a token that you fall in love with and cracks in half after a month, or six months, or six years. I mean for these things to last. They've no reason not to. How many people like splinters? Exactly. Veneers on plywood are notorious for seeking blood from human fingers. Although these solid woods are less susceptible to blood lust, there is a chance. All boards will get finish sanded and cut to size before ever getting near the laser. This will bring out the natural qualities of the wood whether it is a unique luster or pearly grain that could be masked by a rough cut. Once loaded in, the laser will rock out for a bit. For tile sets, the texture will be engraved first, and then the pieces cut second to assure the details blend into the edges of the tiles. Tokens will undergo a similar process, first engraving the images on the faces and then cutting the tokens from the board. Dice towers and other specialty pieces may spend quite a while in here having 3D elements engraved into their surfaces. The engraver burns the wood. This is the nature of the beast. As a result, ash and over-burn may need cleaned from the tokens. As a precaution, all tokens will undergo a rub down to remove pesky ash. Some folks like the look of the burnt wood while others wish it gone. As per the order, the pieces will be cleaned or left with their burned appearance. At this stage, readability and engraving quality will be checked for flaws. Whether it is an unreadable "Djinn" around the edge or a chip flaking from the wood, I'm not sending out anything I wouldn't give you straight from the palm of my hand with pride. Any additional effects are added at this point whether they are metallic edges or perhaps a stain. Once those have cured, a hard clear coat is sprayed over the wood to protect it from scratches, finger oils and gummy bears. This won't make the tokens invincible, but it will protect them for years to come. At this stage, your items are ready to go. They will be packaged in a minimally rattling way to keep them from arriving jumbled like a box of cereal and shipped out to a far off land where adventure awaits! Currently planned 1" tokens to choose from! 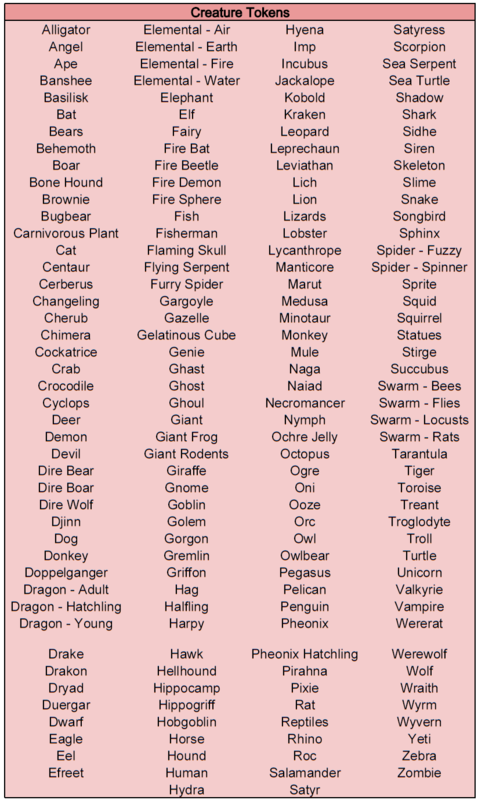 Angels, Ape, Basilisk, Bears, Big Cats (Lion, Tiger, etc), Boar, Carnivorous Plants, Centaur, Class Specific (Fighter, etc), Demons, Devils, Djinn, Dog, Drakes, Dwarf, Elf, Fairy, Fish, Furry Spider, Ghast, Ghost, Ghoul, Giant Rodents, Gnome, Goblin, Griffon, Harpy, Horse (Mule, Donkey), Hound, Human, Kobold, Lich, Lizards, Minor Elementals (Fire, Water, Air, Earth), Minotaur, Monkey, Oozes and Slimes, Orc, Pegasus, Pheonix, Pixie, Scorpion, Skeleton, Snakes, Spinner Spider, Statues, Stirges, Stray Cat, Swarms (Bees, Locusts, etc), Troll, Unicorn, Vampire, Wolf, Wraith, Yeti & Zombie. Did I miss your favorite normal sized creature? Curious about one? Ask me in the comments section! Currently planned 3"x3" Dungeon Accessory Tiles are below! Bottomless Pit, Bubbling Pool, Charred Remains, Magic Circle, Mound of Gold, Mushroom Faerie Ring, Narrow Bridge Over Stream, Offering Pit, Quicksand, Roaring Campfire, Rough Boulders, Spike Pit, Spiral Staircase & Wide Staircase. Something missing? Let me know in the comments section! See earlier pledge levels for other reward details. The following selection of Medium Foliage will be available to choose from! Have an itchy feeling for another? Suggest it in the comments section! See earlier pledge levels for other reward details. The following options are available for 2" diameter tokens! The Stone Starter Tile Set is made from 1/4" hardwood and sized to give you a playable entry into the tile system. Built into a single play field, it is 4"x21" and easily adjusted to 8"x10". See earlier pledge levels for other reward details. The following options are available for the large tree! See earlier pledge levels for other reward details. Covering 140 squares and containing 49 pieces, this set will only be available through this kickstarter! See earlier pledge levels for other reward details. If you want that extra flair, this is the way to go. You can choose either the Metallic Finishing or the Wood Upgrade. Gold metallic finish in various lights on oak. if you choose the Metallic option, any or all pieces will have their cut edges (and optionally faces) painted metallic. What colors? Let's start with Gold, Silver, and Copper. Will we offer more? Possibly. Stretch goals, anyone? If you are not interested in the metallic option, you can get the wood itself upgraded. This tier grants you access to hickory, maple, jetoba, walnut, cherry, and bubinga. For wood pics, check out this update. A survey will be sent out once the kickstarter finishes asking which wood or finish you would like. See earlier pledge levels for other reward details. Introducing Bertie, the Giant Mushroom. The original cardstock version of Bertie the Giant Mushroom basking in the sunlight. Caring and compassionate, Bertie is always attached to your local cave wall and ready to listen to your problems! Bertie likes fresh flowing water, and the Water and Coast Tile Set gives you just that! Giving not only open water but also borders between land and water, this 84 square set lets you set the scene for riverbanks, ocean beaches, and surprise trips into unknown liquids! To fill out the area, I'm including two each of these 1" watery creature tokens: Crab, Eel, Fisherman, Giant Frog, Lobster, Pelican, Piranha, Sea Serpent, Sea Turtle and Turtle! See earlier pledge levels for other reward details. Styled with the branches and leaves of a magnificent tree, this tower will be made of solid 1/4" walnut to provide a dark, rich wood. Standing 12 inches tall with a footprint just over 4"x4", you will be able to see the dice tumble down the tower through the cut sides but only see the final result in the catch at the bottom. Hope is a powerful thing and many players will be trying to will a high roll with their minds as they watch their dice fall. See earlier pledge levels for other reward details. First off, all items specific to this tier will be made from solid 1/4" cherry unless otherwise requested to red oak! Pyrola is a 3D fiery altar fit for the finest rituals. Whether summoning a demon, offering the innocent to a dark power, or both at once, this piece is sure to add amusement to any room. The Lava and Fire Tile set will cover several burning objects, outright burning areas, pools and flows of lava, and other burning hot details. It will be 84 squares in area and made of solid 1/4" cherry. To really feel the fire lord, you need fire minions. You will receive two of each of the following 1" tokens in cherry: Fire Bat, Fire Beetle, Fire Demon, Fire Dragon Hatchling, Fire Sphere, Flaming Skull, Hellhound, Phoenix Hatchling, Small Fire Elemental and Small Salamander. See earlier pledge levels for other reward details. Monsters and mazes are great, but rewards (or bait, as storytellers will tell you) can be the stuff of legends. The Kickstarter Loot and Treasure tile set will contain 49 tiles covering 140 square units or hordes, piles of coins, jewels, chests and other highly prized items. With great wealth, comes great wood. As an Ironwood Royal Treasurer, you will also have access to the premium wood selection: leopard wood, wenge, purple heart, tulip wood, cocobolo, and zebra wood. See earlier pledge levels for other reward details. The Death's Grip dice tower will be made of dark, waxy wenge and look as if a hand is grasping the tower. It will stand 12" tall and have a footprint a little over 4"x4". As with the Tree of Life dice tower, this one will have holes and cutouts that show glimpses of the falling dice but only allow the results to be viewed from one side. To go with your tower will be your private 50 member undead horde made from solid 1/4" ebony: 10 skeletons, 10 zombies, 4 Bone Hounds, 4 Ghasts, 4 Ghosts, 4 Ghouls, 4 Liches, 4 Vampires, 4 Wraiths and 2 Necromancers. I'd love to have lunch with you. I'd love to fly you out to a convention. But really, this project is about the stories we tell and the tools we use to tell them. What I offer here is to design a full set of tools to create the exact world that you see in your head. Whether in the aether or deep underground, in this plane or another, I will work with you via skype, email, and/or phone as you prefer to flesh out your world in solid hardwood token, tiles and tools. The Catan Desert Tile! Interlocking edges are included, but not shown. For all of you Catan lovers, I've added a Catan set to the mix! 19 center tiles with a ring of 18 tiles and 18 number tokens to mark the tiles, all made of 1/4" red oak and interlocking, as well as 4 sets of playing pieces (red oak, maple, walnut and cherry) for $20. See more here! With 10 days to go, I welcome three pendants to the pledge reward offerings! Last but not least is a splatted fairy. Don't have one yet? Well, you better think on changing that. She comes facing your chest (they normally fly forwards, after all) and the wings will have supporting material to keep them from turning to splinters. All three will be engraved from solid hardwoods and stand right around 2 1/2 inches (7cm) tall. For a better view of the art, check the image at full size here. You can now get the gaboon ebony undead tokens from the Ironwood Lich Overlord tier outside of that level! For $10, you can get 5 1" undead tokens engraved from solid gaboon ebony, the black wood you know and love from piano keys. The current selection of undead includes skeletons, zombies, bone hounds, ghasts, ghosts, ghouls, liches, vampires, wraiths and necromancers. If you have other ideas for undead, feel free to inquire. I can work with you and give others an additional selection as well! If you want more than 5 or wish to add these delightful undead to your other pledge level, increase your pledge accordingly and we'll sort everything out with you! There have been several of you interested in adding a dice tower and now you can! For $30, you can get either a "Tree of Life" or "Death's Grip" dice tower made from solid 1/4" red oak that can ring in natural 20's with a satisfying clickaclack! The "Tree of Life" tower is in the pattern of a great tree where you can see the dice fall through slits and slots between the branches before they rest hidden in the roots. The "Death's Grip" tower is that of a skeletal hand grasping onto a stone brick structure from out of the ground causing broken bricks and mortar. Can't decide? Pledge $50 to this level and receive both the "Tree of Life" and "Death's Grip" towers in red oak! Looking to add to another pledge? Add $30 for 1 tower or $50 for both! International customers should include an increase in their pledge to account for $60 total shipping. These large towers don't fit inside the cheaper shipping materials. Huzzah! You can find your way around the table with the handy dandy compass! The compass is styled after old time nautical compass rose found on maps. Art to come on this one as I was really not expecting to hit 5k so soon! Now introducing DM screens! The screen will be made from 1/4" wood and measure 8.5" tall (sheet of normal paper short-ways). It is comprised of 4 sections that will be either finger-hinged or metal hinged together for a total length of 44" inches (possibly a smidge longer depending on hinge testing). The player side will be engraved with your preference of dragons, stone wall, greenery, swirls or left plain as per your request. In the end, I'll put whatever you prefer on the back side as this is probably the easiest of the engravings to set up. The DM side can be left plain for you to tape, glue and stick things to or have desired rules engraved into it. I won't go into detail on them, but I will put whatever system's info you prefer onto it, D&D to Pathfinder and beyond. I'm only offering the blind in wood I know I can get in the proper width: red oak, maple, walnut and cherry. Price scaling is based on the wood used. :) If you have questions, please feel free to ask! It was suggested to me that an inkling in my mind may have been right: people would like to build their own sets. Seeing as the rewards can't be changed once they're up, I'm offering a tier dedicated to this. Enjoy building your own collection! If you're looking for a the standard list of tokens offered but in different woods, this is your stopping place. Add as many of the tokens you like for their value below based on wood. Want 5 cherry kobolds and 5 wenge orcs? We can make that happen. Just add the cost of a cherry and wenge 1" set of five to your pledge! If you have any questions on what your total would be for your desired set, feel free to send me a message and I'll let you know. 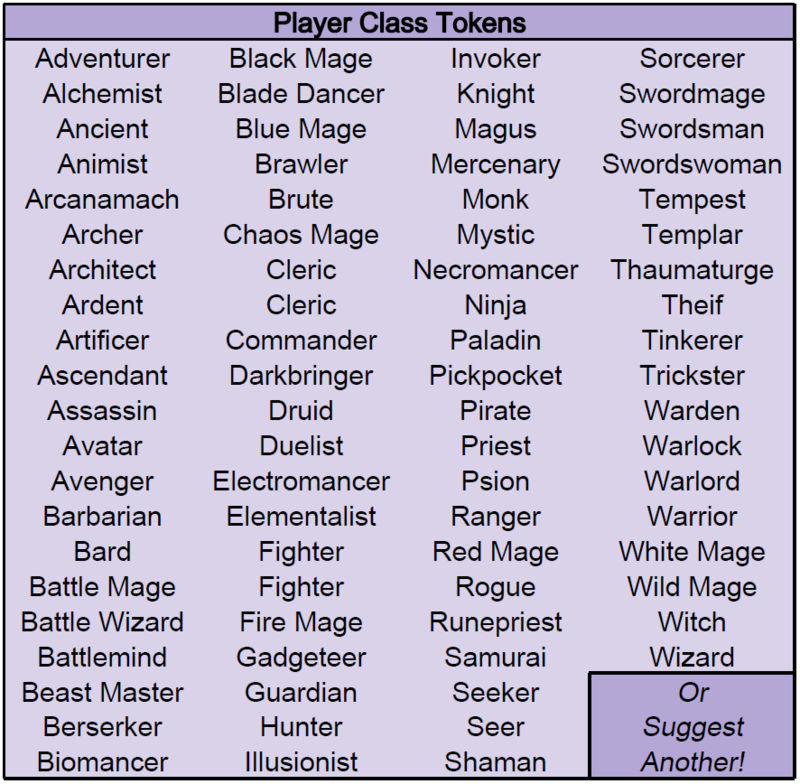 :) See the list of available Creature Tokens and Player Tokens! Not seeing what you'd like? Want custom text for your character? We can fix that together here. Custom tokens have a custom picture and/or text. If you're interested in a particular flavor of tower, you can have your pick now. Any wood is available other than tulip because it is too narrow. Custom dice towers are built based on your vision and are added to the catalog of available towers with an optional reference to you. Exclusive dice towers are one-off creations that will exist in your hands alone. Designed to your desire, these will be available to no one else. For international backers, this will require your shipping to be increased to $60. The dice towers are too large for the cheaper sipping rate, I'm afraid. One of my biggest mistakes was making the tile sets so hard to get a hold of for those who really wanted them. This, my friends, is resolved. Small sets are 84 square inches in size and include a variety of tiles within the set. Large sets are 140 square inches in size and include an even more impressive assortment of tiles within the set. To see more details on the tile sets, check out this update! To add to your pledge, add the total of the desired tile sets to your pledge amount! If you need help, feel free to ask! To add to another pledge, add the appropriate amount to your pledge! If there is any confusion or you have a question, just ask! The pendants referenced elsewhere can also be added to your collection! D20-Rooted Tree, 3 Leaves and Splatted Fairy pendant draft sketches! 6k - Locked: Laser cut and engraved boxed to carry all your dice, tile, and tokens! 6.5k - Locked: Engraved clipboards for players to clear table space! 7k - Locked: Taking Suggestions! Thank you to the artists that are helping to make this possible! Laser Malfunction - There is a possibility that the laser manufacturer that I am going through will experience some sort of calamity. Although lasers are generally cooperative, an event like this may delay the shipment of the laser engraver. If this is the case, I will consider other lasers, but most likely stick with the solid laser I've chosen. If the laser becomes unavailable, the project will be able to be completed in every way with other lasers, but researching the best second option within the budget will cause a small delay. Wood Shortage - My wood supplier has been around since 1981 with 3 locations within reasonable driving distance. Although it would sadden me, I have secondary people that I can get the supplies from in the event of these locations being unavailable or out of stock. Order Avalanche - It is possible that the number of orders will shock me. This is why the delivery date is set for December 2013. In reality, this is a sort of "worst case scenario" but if things get crazy in here, I may be forced to delay shipping some rewards. All Kickstarter rewards will go out before I engrave anything for future orders. You folks are making this a reality and you deserve dibs. Ironwood Tokenkeeper - 10 1" engraved red oak tokens signed with our thanks! These will be from the first edition of released tokens. The survey sent after completion will let you pick and choose your favorites for this and every other tier! Ironwood Mint - This pledge level provides 10 1" solid hardwood tokens for every $5 pledged. Pledge $10 and receive 20 tokens! Pledge $50 and receive 100 tokens! 1 2" token can be substituted for 4 1" tokens if you're looking for some larger foes! This pledge level is not included in the "All above rewards" in later levels and stands alone. All tokens will be marked with a kickstarter-edition marking on the back and signed with our thanks! Ironwood Pieceworker - Use this pledge level for the modular purchases if you're not interested in any other tier! This tier is simply to minimize confusion and is not included in any other pledge level. Ironwood Interior Designer - All of the above rewards AND 2 3"x3" Dungeon Accessories that can be used alone or locked into the tile sets signed with our thanks! Ironwood Protector - A solid hardwood pendant engraved from solid red oak, maple or hickory signed with our thanks! This pledge level is not included in the "All above rewards" in later levels and stands alone. For multiples, pledge the total value. 2 = $20. 3 = $30 etc. Add to another pledge by adding $10 each! Ironwood Undead - 5 1" Gaboon Ebony Undead tokens signs with your thanks! This pledge level is not included in the "All above rewards" in later levels and stands alone. For multiples, pledge the total value. 10 tokens = $20. 20 = $40. 50 tokens = $100. Add to another pledge by adding $10 per set of five! Ironwood Pits & Nuts - A solid hardwood pendant engraved from cherry or walnut signed with our thanks! This pledge level is not included in the "All above rewards" in later levels and stands alone. For multiples, pledge the total value. 2 = $30. 3 = $45 etc. Add to another pledge by adding $15 each! Ironwood Heart - A solid hardwood pendant engraved from purpleheart or yellowheart signed with our thanks! This pledge level is not included in the "All above rewards" in later levels and stands alone. For multiples, pledge the total value. 2 = $40. 3 = $60 etc. Add to another pledge by adding $20 each! Ironwood Settler - 19 center tiles with a ring of 18 tiles and 18 number tokens to mark the tiles, all made of 1/4" red oak and interlocking, as well as 4 sets of playing pieces (red oak, maple, walnut and cherry). This pledge level is not included in the "All above rewards" in later levels and stands alone. Add to another pledge by adding $20 each! Ironwood Landscaper - All of the above rewards AND 2 medium 3D foliage pieces signed with our thanks! Ironwood Emblazoned - A solid hardwood pendant engraved from tulipwood, zebrawood or ebony signed with our thanks! This pledge level is not included in the "All above rewards" in later levels and stands alone. For multiples, pledge the total value. 2 = $50. 3 = $75 etc. Add to another pledge by adding $25 each! Ironwood Barrier - A 8.5"x44", 4-sectioned, hinged DM screen engraved on both sides with art or information as you like! Be sure to pledge for the price of the wood you'd like! This pledge level is not included in the "All above rewards" in later levels and stands alone. To add this reward to another pledge, add the amount of the screen to your pledge! Ironwood Mason - All of the above rewards AND 4 2" tokens and a 22 piece, 84 square area starter stone tile set signed with our thanks! Ironwood Curator - All of the above rewards AND 10 more 1" tokens, another 3"x3" Dungeon Accessory, and a large tree signed with our thanks! Ironwood Architect - All of the above rewards AND a kickstarter exclusive full map set of 49 pieces covering 140 square units signed with our thanks! Ironwood Metallurgist - All of the above rewards upgraded to a metallic, hickory, maple, jetoba, walnut, cherry, or bubinga version signed with our thanks! Ironwood Aquarist - All of the above rewards AND Bertie the Giant Mushroom, a Water and Coast tile set of 22 pieces covering 84 tiles, and 20 additional 1" watery creature tokens signed with our thanks! Ironwood Oracle - All of the above rewards AND a filigreed, metallic, walnut "Tree of Life" dice tower signed with our thanks! Ironwood Fire Lord - All of the above rewards AND Pyrola the Fire Altar, a Lava and Fire tile set of 22 pieces covering 84 squares, and 20 additional 1" fiery creature tokens signed with our thanks! All rewards specific to this tier will be made out of solid cherry. Ironwood Royal Treasurer - All of the above rewards AND a second Kickstarter-exclusive full map set of treasure, loot, and shinies in either metallic or premium wood signed with our thanks! The premium woods include leopard wood, wenge, purple heart, tulip wood, cocobolo and zebra wood! Ironwood Lich Overlord - All of the above rewards AND a filigreed, metallic "Death's Grip" wenge dice tower, and a horde of 50 black ebony undead tokens signed with our thanks! Ironwood Hand of Fate - All the above rewards AND a full, custom map and token set for your specific campaign. Whatever your world. Whatever your story. I will work right with you via skype, email, or in person (if you stop by) to design your very own set of dungeon tiles, dungeon accessories, tokens and map features. You will also acquire my undying gratitude and potentially a small shrine in my home.